The supply of locomotives for the line was initially under the direction of Mr. W. Kirtley who was at that time the Superintendent of the London, Chatham & Dover Railway. On being appointed as a consultant to the H&BR, he quickly supplied the first forty-two engines to his own design. All of these locomotives were constructed by Beyer, Peacock & Co. Ltd. All of the H&BR's locomotives were constructed by independent manufacturers. The first twelve locomotives were 0-6-0T shunting engines of what later became Class G1. The next twenty locomotives were coal traffic 0-6-0 tender engines which later became Classes D & E. The next ten engines were 2-4-0 passenger engines of what later became Classes H & H1. Just prior to the line opening for traffic in 1885, Matthew Stirling was appointed Locomotive Superintendent, a position which he retained throughout the life of the company. His first locomotive order was for six 0-4-0Ts from Kitson & Co of Leeds. These were a standard 'off the shelf' design and in practice were little more than an 'undressed' version of the company's street tramway engine. Owing to their small size, these engines were ideal for shunting the quays of Alexandra Dock. All of these early Kirtley and Kitson engines were withdrawn prior to grouping in 1923 so never received LNER numbers. Nearly all of the subsequent locomotives were absorbed into LNER stock and thus received LNER class designations and numbers. 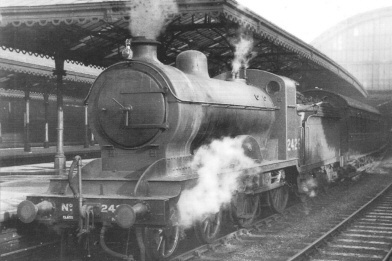 The first forty-five locomotives to appear on the line to Stirling's own design were the Class B 0-6-0 (LNER Class J23) tender engines, these all bore the family trademark domeless boilers. These engines were popular with their crews and were the workhorses of the railway even taking in occasional passenger turns. A further ten locomotives of this design were built in 1907. All were withdrawn by 1938. 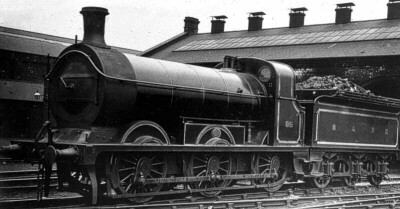 Three Class G2 0-6-0T (LNER J80) tank locomotives were built in 1892 all withdrawn by 1931. Following these were five Class F1 0-6-2T (LNER N11) engines in 1900, all withdrawn by 1946 and nine Class F2 0-6-2T (LNER N12) engines all withdrawn by 1938 apart from LNER No. 9089 which survived until 1948. Six Class G3 0-6-0T (LNER J75) locomotives were built in 1901, a further ten being built in 1908, all were withdrawn by 1939 apart from LNER No. 8256 which survived until 1949. The giants of the line were the fifteen remarkable Class A 0-8-0 (LNER Q10) tender locomotives designed by Stirling to haul the heaviest goods trains of up to 780 tons up the 1 in 100 gradient from Hull onto the Yorkshire Wolds. Built in 1907 by the Yorkshire Engine Company they were constructed with Belpaire fireboxes and were affectionately known as "Tinies". All were withdrawn by 1931. Five Class J 4-4-0 (LNER D24) tender engines were built primarily for the Sheffield expresses by Kitsons in 1910. These were very handsome engines and were seen as the H&BR flagship locomotive. All were withdrawn by 1934. Four Class F3 0-6-2T (LNER N13) locomotives were built in 1913, followed by a further six during the next year. Nine of these engines survived to Nationalisation (1948). BR No. 69114 was the last H&BR locomotive working in the BR period. It was withdrawn from Leeds Neville Hill in 1956. A total of twenty 0-6-0 engines classified as either L, L1 and LS were constructed between 1911 and 1915, all of these engines were re-classified as J28 by the LNER. Ten engines of Class L1 tender locomotives were built by Kitson's in 1911 and 1912, five used saturated steam, the remainder using superheated steam, these, along with the later five Class LS locomotives were the only H&BR engines to be fitted with superheaters. Five Class L tender engines were built in 1914 by the Yorkshire Engine Company. Five Class LS tender engines were built in 1915 by Kitsons, these used superheated steam. These Class LS engines were the last locomotives ordered by the H&BR. All twenty L, L1 and LS engines were withdrawn by 1938. By 1915 the H&BR had a locomotive stock of 186 engines, 181 of which passed on to the NER. The LNER inherited 138 of these engines. Thank you to John Broadwell for the above locomotive summary. The photograph of the Class J is courtesy of Steve Chapman. Thank you to Malcolm Peirson for the photographs of Class G3 No. 113 (LNER Class J75) at Springhead, and Class B No. 86 (LNER Class J23) at Springhead.